Objective: To determine the prevalence of severe chronic periodontitis in a cross-sectional national sample of Colombian adults held by the Colombian Health Ministry. Methods: In 2014, a selected national sample, based on a multi-stage, stratified method, received an oral examination. Periodontal data was collected on 9,821 adults aged 18-79 years following a full-mouth examination. Pocket depth (PD) and clinical attachment loss (CAL) served for extent and severity of disease description. Two systems for detection of severe periodontitis cases were used. The first was the criteria for surveillance of periodontitis described by the Center for Disease Control and the American Academy of Periodontology (2014), the second was the periodontitis case definition described by the European Federation of Periodontology (EFP, 2005). Weighted prevalence was calculated and logistic models constructed to assess the association with demographic, socio-economic and oral hygiene factors. Results: Based on the CDC-AAP criteria, the prevalence estimate of severe periodontitis was 10.6% (standard error (SE) 0.2), and for moderate periodontitis was 43.6% (SE 0.4). Adults aged after 65 had a high prevalence of severe periodontitis, 26.0% (SE 0.9), and a low mean number of teeth, 8.0 (SE 0.1). Increases in the presence of PD leveled after age 45, but CAL continued to increase in the age range 65-79, as approximately 23.7% of teeth, not previously affected, demonstrated CAL ≥ 1 mm at this age range. Factors associated with severe periodontitis were age, gender, income, smoking habits and presence of diabetes. For the EFP detection system, not-daily oral hygiene had an association. 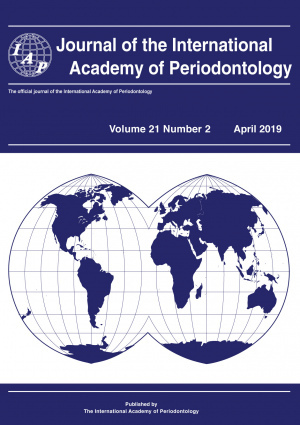 Conclusions: Prevalence of severe periodontitis was 10.6%, a lower percentage than other epidemiological studies in Latin America; but still a high proportion of individuals, which would support the importance of preventive and treatment strategies for the country.